Another dilutive announcement sent Plug Power's shares lower on Wednesday. Shares of hydrogen company Plug Power Inc (NASDAQ:PLUG) fell as much as 12.9% today after warrants to buy the company's shares were exercised. Shares recovered slightly by mid-day and were down 7.7% at 11:05 a.m. EDT. Plug Power has entered an agreement with Tech Opportunities, who will exercise 10.5 million shares in the company for $1.50 per share, and in exchange will get another 5.3 million warrants to buy shares for $2.69 per share. The move will bring $15.8 million into the company, which will likely be used to fund growth from the supply deal with Amazon announced a week ago. The cash may be needed to meet supply agreements, but if those agreements don't eventually become profitable for Plug Power, the company will keep going to shareholders with pockets turned out, looking for cash. The chart below shows why dilution from warrant sales like this are such a problem. 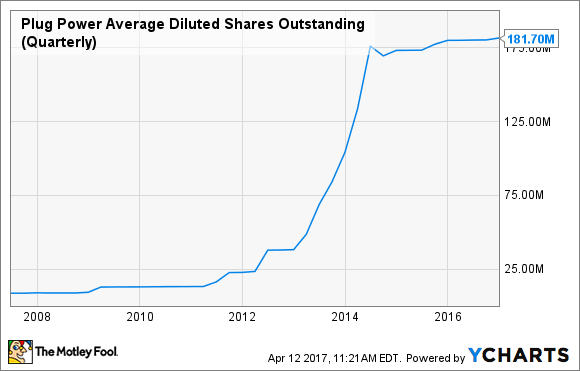 Over the last decade, shares outstanding have grown 20 times, and they'll likely grow more in the future. Tech Opportunities and Amazon alone have 5.3 million and 55.3 million warrants, so there will be more dilution in the future. PLUG Average Diluted Shares Outstanding (Quarterly) data by YCharts. Plug Power has a lot of growth opportunities ahead, particularly after the Amazon deal, but funding growth could be costly. And there's no evidence in the company's history that big supply deals will be profitable, either. Worse yet, the upside in the stock goes to companies who own warrants and will dilute current shareholders. As we saw after the Walmart deal in 2014, big supply deals don't necessarily end well for shareholders in the long term.